How You Can Buy Gold For Less Than $10 An Ounce | Energy and Gold Ltd. Legendary oil investor T. Boone Pickens once famously stated that it was cheaper to buy a barrel of oil on the floor of the New York Stock Exchange than it was to drill for it or buy the oil in the futures market. Pickens made this statement in the mid-80s when oil stocks were near a cyclical low, he was right and would go on to make a fortune from investing in oil companies over the next several years. A similar situation is presenting itself in gold mining shares right now as the cheapest way to buy ounces of gold are through shares of gold mining & exploration companies. It’s not often that an investor can buy more than 500,000 ounces of gold in the ground for less than US$10/ounce. This exact situation is currently available via shares of Banyan Gold (TSX-V:BYN); Banyan’s Hyland Gold Project has 524,000 Au-equivalent ounces (236,000 ounces indicated, 288,000 inferred) at an average grade of .84 g/t gold. At Banyan’s current market cap of C$5.3 million the market is valuing Banyan’s 43-101 compliant gold resource at Hyland at a meager US$7 per ounce of gold in the ground. Now I know you must be thinking that the Hyland Project must be on top of a mountain, or the project has metallurgical issues, or that there must be some big permitting roadblock that will ensure the project never advances to production. Fair enough particularly considering how cheaply valued Banyan shares are currently, however, Hyland has no such issues. In fact, Hyland has road access and an existing camp and equipment on site. Hyland is also located 70 kilometers from Watson Lake (population: 1,200) and sits on fairly flat terrain at a relatively low elevation (~1200 meters). Hyland has a similar tectonic setting to Nevada’s prolific Carlin Trend and what’s even better is that the vast majority of gold mineralization at Hyland is near surface (75 meters depth or less) and the bulk of the resource is oxide which means that it is amenable to heap leaching (metallurgical testing has yielded gold recoveries of 86%). Banyan Gold is led by CEO Tara Christie, M.A.Sc., P.Eng. 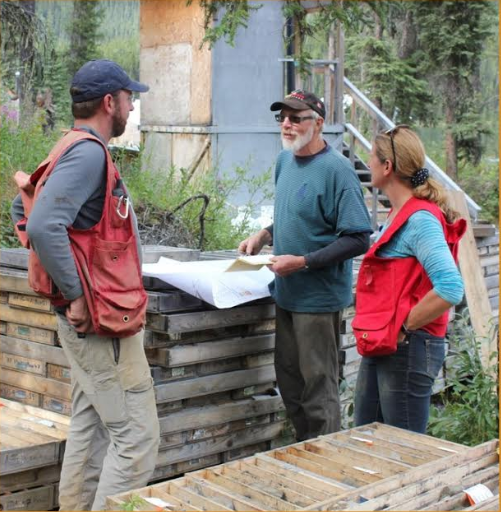 – Mrs. Christie has more than twenty years of experience in the mining and exploration industries including having personally placer mined more than 20,000 ounces of gold in the Yukon. Mrs. Christie comes from a family with a long history of placer mining in Canada’s Yukon Territory – in fact, her brother Sheamus has even been one of the main characters on the Discovery Channel’s hit series “Gold Rush”. When having a conversation with Tara it doesn’t take long to figure out that she really knows her stuff – mining and minerals exploration is in her blood and she has a passion for it. She also has a passion for building a successful gold exploration company with Banyan Gold. Tara is an efficient CEO who takes her role as a steward of shareholder capital very seriously. In fact, she has invested a significant chunk of her own funds into Banyan and she has been a regular buyer of BYN shares on the open market. CEO Tara Christie owns over 4 million BYN shares and she recently added 1.33 million shares (C$100,000) in the July private placement at C$.075 per share. Insiders in total own more than 20% of Banyan shares and two much larger companies (Alexco Resources and Victoria Gold) whose property packages border Banyan’s Aurex-McQuesten Project (AurMac) own an additional 14.3% of Banyan shares. In all, insiders and closely related parties own roughly ½ of Banyan Gold’s shares outstanding. In my recent interview with legendary mining investor Ross Beaty there was a great quote towards the end: “look at management of companies very carefully and try to find investments in which management is invested in their deals and where management has a track record of wealth creation.” Given CEO Tara Christie’s tremendous success as a Yukon placer miner and the strong insider ownership at Banyan it would appear that Banyan Gold meets Mr. Beaty’s criteria. Metallurgical work has also shown average oxide gold recoveries of 86%. 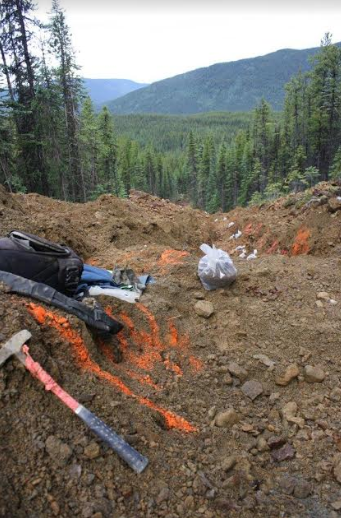 A view from a trench at Banyan’s Hyland Gold Project in the Yukon. In 2016 Banyan had a trench return .64 grams/tonne gold over 96 meters (from 0 to 96 meters) at the Camp Zone. 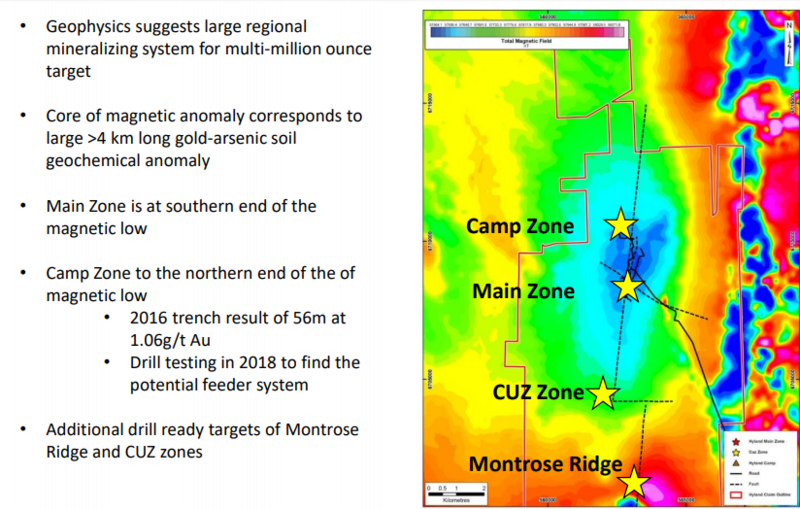 In its 2018 drill program Banyan drill tested the Camp Zone and assays are expected back within a couple weeks. The summer 2018 program at Hyland was focused on strategic drilling between the Main Zone and Camp Zone in order to test continuity of mineralization and structure (2.5km strike of geochemical anomaly) – this strategic drilling consisted of 1300 meters over a 1.25 kilometer area north of the Main Zone. 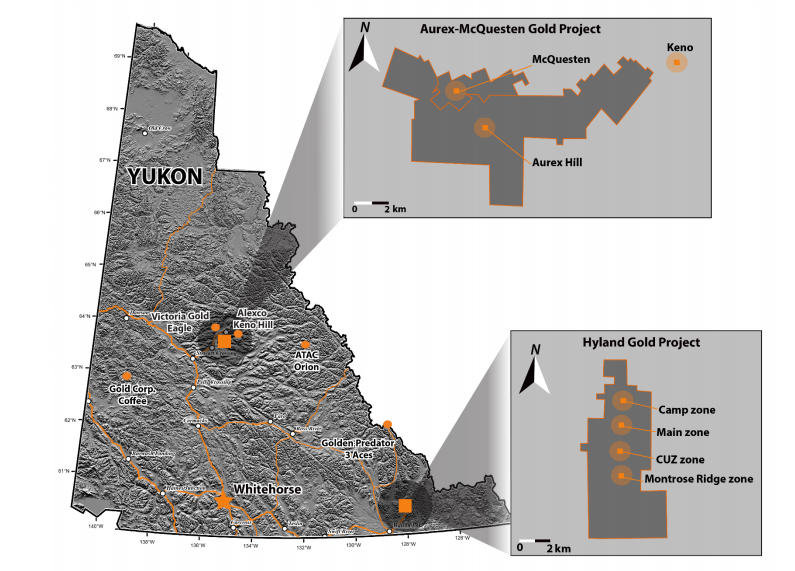 Banyan’s #2 project, Aurex-McQuesten (AurMac), is located in the Keno Hills area of the Yukon (home of the world’s highest grade silver district). AurMac is surrounded by 3 much larger companies: Alexco Resources, Metallic Minerals, and Victoria Gold. AurMac comprises 9320 hectares with significant regional resource potential. Both Alexco and Victoria are large shareholders in Banyan and they are both very supportive of Banyan’s exploration efforts at AurMac, including sharing geological data and expertise. Given its prime location (in the middle of an emerging mining district) and the fact that C$7 million has been spent on exploring the property package by previous owners, from my vantage point AurMac is worth at least as much as Banyan’s total market cap right now (C$5.7 million). Especially considering that there will be two operating mills within trucking distance by the end of 2019, another source of ore could be quite valuable to either Alexco or Victoria in the future. Investors who buy BYN shares at C$.075 or below are essentially getting Banyan’s flagship Hyland Project for “free”. As I write these words Banyan is conducting its summer 2018 exploration program at AurMac with a goal of finding the potential feeder system for historic gold intercepts on the property that have ranged from .87 grams/tonne gold all the way up to 9.98 grams/tonne gold. Banyan is currently conducting a soil surveying program with a trenching program and 600 meters of diamond drilling to follow once the soils have been analyzed. Once this program is completed Banyan intends to conduct a diamond drilling program of up to 2,000 meters at AurMac, either later in 2018 (winter drilling is possible at AurMac) or in 2019. The cyclical bear market in junior gold mining shares has delivered many bargain basement opportunities to investors who are able to value real potential in uncommon assets (more than 500,000 ounces of easily mineable gold in a top tier mining jurisdiction) and look ahead to a brighter future for the precious metals sector. Investment opportunities aren’t ‘cheap’ when everything looks great and everyone is piling into the sector. They arise when a sector is out of favor and the vast majority of investors don’t care to look to a brighter future. However, the pendulum eventually always swings back the other way and shrewd investors who bought near the bottom of the cycle are rewarded with handsome profits. I believe Banyan Gold is an attractive junior gold investment opportunity with multiple ways in which shareholders can win (upturn in the sector, exploration success, etc.). Moreover, even if the sector takes another year to turn around under Tara Christie’s leadership Banyan manages its cash burn (Banyan’s base cash burn is less than C$300,000 per year, excluding exploration costs) and you can rest assured that she is not interested in unnecessarily diluting shareholders. Disclosure: Author is long Banyan Gold shares in a long term investment portfolio. The article is for informational purposes only and is neither a solicitation for the purchase of securities nor an offer of securities. Readers of the article are expressly cautioned to seek the advice of a registered investment advisor and other professional advisors, as applicable, regarding the appropriateness of investing in any securities or any investment strategies, including those discussed above. Banyan Gold Corp. is a high-risk venture stock and not suitable for most investors. Consult Banyan Gold Corp’s SEDAR profile for important risk disclosures. EnergyandGold has been compensated to cover Banyan Gold Corp. and so some information may be biased. EnergyandGold.com, EnergyandGold Publishing LTD, its writers and principals are not registered investment advisors and advice you to do your own due diligence with a licensed investment advisor prior to making any investment decisions.